If the 2015-16 campaign was about raising eyebrows, the 2016-17 season will be about rising expectations for the New Jersey Devils. General manager Ray Shero and head coach John Hynes set the tempo with a new style of fast, attacking and supportive hockey. Now a year into the new program, they’ve been able to assess the organization from top to bottom. While still building, the Devils appear to be accelerating the development process, at least on paper. Last season saw the Devils in postseason position through the All-Star break. Goalie Cory Schneider was an All-Star. Adam Henrique and Kyle Palmieri both registered 30-goal seasons. Avoiding prolonged injuries, maturation on defense and consistency in even-strength scoring will all be keys to improvement this season for New Jersey. 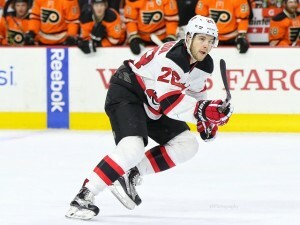 The Devils added former forward Ryane Clowe as an assistant coach. In obtaining Taylor Hall from the Edmonton Oilers for Adam Larsson, the Devils made the steal of the summer. Larsson will be missed for sure, but New Jersey still has multiple young defensemen on the rise. 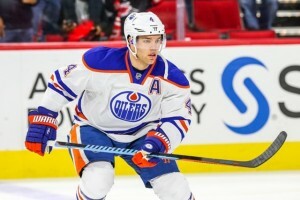 Plus, Hall is considered a consensus top five left-wing in the league. Hall additionally gives New Jersey the elite scoring they’ve been thirsting for since the departures of Zach Parise and Ilya Kovalchuk. Playing with a chip on his shoulder should give Hall the motivation he needs to succeed. Joining former Windsor Spitfires teammate Adam Henrique, along with another 30-goal scorer in Kyle Palmieri, Hall won’t have the pressure of carrying the load as a franchise savior. Hall is still 24 and his career should be trending upward from here. Devante Smith-Pelly is another potential steal with tons of upside. After New Jersey swapped Stefan Matteau for Smith-Pelly, all he did was eclipse his season point total (13, versus his 12 with Montreal) in 28 fewer games. Like his current and former Anaheim Ducks teammate Palmieri, it clicked for Smith-Pelly in 18 games with New Jersey. Plus, Smith-Pelly surpassed in 18 games, what Matteau accomplished in parts of three seasons with the Devils. Like Hall, Smith-Pelly is only 24 and may have found a home in the Devils den. New Jersey hopes a hip pointer suffered by Zacha against the Toronto Marlies doesn’t linger into this season. If Zacha is anything like Petr Sykora or another fellow Czech, Bobby Holik, the Devils may have themselves another special player. 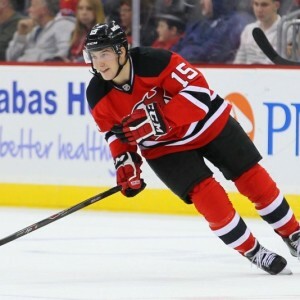 When asked a few years back which young Devils defenseman was the most untouchable, legendary Devils defenseman Ken Daneyko named Damon Severson. This season, Severson will get the chance to live up to that label. Depending on what transpires in camp, Severson looks to be the man who will replace Larsson on the New Jersey blueline. 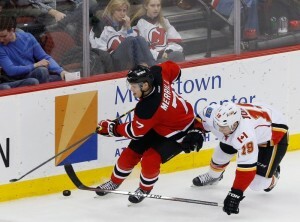 Severson continues to improve his game, leading all Devils blueliners with 21 points last season. Severson also proved himself to be a leader late last spring with Albany, standing up for his teammates during a season-ending brawl against the Bridgeport Sound Tigers. Taking his game to the next level in the postseason, Severson connected on eight helpers across eleven playoff contests. If Severson keeps improving, New Jersey could find itself playing in important games this spring. Depending on what transpires in camp, Severson looks to be the man who will replace Larsson on the New Jersey blueline. Severson continues to improve his game, leading all Devils blueliners with 21 points last season. Severson also proved himself to be a leader late last spring with Albany, standing up for his teammates during a season-ending brawl against the Bridgeport Sound Tigers. Taking his game to the next level in the postseason, Severson connected on eight helpers across eleven playoff contests. If Severson keeps improving, New Jersey could find itself playing in important games this spring. Taking his game to the next level in the postseason, Severson connected on eight helpers across eleven playoff contests. If Severson keeps improving, New Jersey could find itself playing in important games this spring. He won’t outright replace Larsson but Ben Lovejoy brings the Devils experience and a Stanley Cup pedigree on the back-end. Lovejoy was a plus-nine and recorded ten points across 66 regular season games last season. Lovejoy played in all 24 of Pittsburgh’s postseason contests, notching six points. Having played for Hynes with the Wilkes-Barre/Scranton Penguins, Lovejoy should make a seamless fit with the Devils’ culture and style of play. When your first impression in front of the home faithful evokes whispers of Scott Stevens, you’re on the right track. Although he was assessed a roughing minor for a check on Toronto’s Andrew Campbell, it was the type of hit that sent the crowd into a frenzy. The Devils hope Santini can provide that physical presence and make the jump from college to the NHL. With Seth Helgeson out of options, Santini could start out at Albany, but an impressive camp may alter his stature on the squad. Last season saw Cory Schneider cement himself as a top-five netminder. Joining the elite, Schneider was named an All-Star for the first time last year. Despite playing in eleven fewer games, due to injury, Schneider set a career high with 27 victories, lowered his goals-against average to 2.15 and posted four shutouts. With Schneider in net, the Devils are always in the game, even with a dearth of scoring and a young defense corps. Now 30, Schneider is hitting his prime and the Devils will rise as high as he does. Waiting in the wings, Kinkaid and Wedgewood combined to post three shutouts last season. After a few cups of coffee with New Jersey and much seasoning at Albany, Reid Boucher looks primed to stay for good. There were big hopes for Boucher, following his 62-goal outburst with OHL Sarnia in 2012-13. Last season saw things begin to click for Boucher, dominating at the AHL level and gaining the confidence of head coach John Hynes with the parent club. In less than half a season (39 games) with New Jersey, Boucher registered eight goals, half of them of the game-winning variety. After netting 19 markers in 34 games at Albany, Boucher recorded ten points in eleven Calder Cup playoff games. If granted the opportunity, Boucher, still only 23, could light the lamp 20-plus times this season with the papa Devils. Why did I choose to focus on these two? It all comes down to durability. There’s no doubt Cammalleri can post big numbers, but in two seasons with New Jersey, he has missed 54 games with injuries, including nearly half of last season. If Cammalleri plays more than 60 games, one can virtually pencil in 25-goals and that can make all the difference between narrowly making or missing the postseason. In the case of Merrill, you have a guy who was highly touted out of Michigan and, while still 24, is a veteran of this young crop of Devils’ defencemen. Merrill missed 35 games last season and when he was healthy, struggled with a minus-15 rating. With Santini, Seth Helgeson and Vojtech Mozik waiting in the wings, Merrill needs to step up his game this season. This off-season, the AHL Albany Devils lost their top eight scorers from the 2015-16 campaign. That being said, the pipeline still gives the parent club a few options. If we’re running on the assumption that Zacha, Santini, Boucher, Joseph Blandisi and Miles Wood will make the big club out of camp, that gives a clearer picture of who is the next man up. The number of open roster spots in New Jersey will also be dependent upon whether the club signs any additional free agents or brings back Patrik Elias. At forward there’s Nick Lappin, who led the A-Devils with five goals during the Calder Cup playoffs. Blake Pietila also emerged late last season and got a cup up coffee with New Jersey. In addition, 2014 first round pick John Quenneville, is highly regarded by Devils’ brass and is expected to start the year at Albany. On defense, Vojtech Mozik was solid, leading the A-Devils with a plus-28 across 53 contests, garnering a late season call-up with New Jersey. Reece Scarlett is also moving up the depth chart in the eyes of management. In net, Wedgewood made quite the impression on the Devils organization. Last season, Wedgewood battled through injuries, posting a 1.55 goals-against average and a .933 save percentage with Albany. Across four NHL starts, Wedgewood won two, posted a 1.24 goals-against average and a .957 save percentage, blanking the eventual Stanley Cup champion Penguins with a 39-save victory at Pittsburgh. To me the biggest question surrounding the Devils this season is: can they take the next step with sustained consistency? Were the 30-goal seasons by Henrique and Palmieri the result of a career year or something they build upon? Does Hall jump up and hit the 30 or 40 goal plateau as well? Will Schneider be able to carry an even younger defence corp and steal games when the team doesn’t score? If the Devils are going to improve this season and sneak into a Wild Card spot, they’ll need to play better at even-strength. While the Devils played solid on special teams, sporting a ninth ranked power play (19.9%) and an eighth-rated penalty kill (83.0%), their 109 five-on-five goals were dead-last in the league. Plus, the Devils need to stay healthy after 405 man-games lost last season which was second-most in the league. The Devils will be better and boast more skill this season. However, unlike last season, they’re not going to sneak up on anyone, anymore. Yes, there will be growing pains on defense but I believe the effort and work ethic which helped them overachieve last year, coupled with more scoring from Hall and their maturing prospects like Zacha, Boucher, and Blandisi, will allow them to capture their first postseason birth since 2011-12. Make sure to comment below with your opinions on how the 2016-17 season will pan out for the Devils or head over to the THW Twitter feed or Facebook page and join the conversation on all of our NHL coverage.